If you are a foodie heading to San Sebastian, there’s one tradition you need to know about: the Basque Cider House. Called sagardotegi in Basque, these temples to great food and drink are open from late January to the beginning of May. Visiting the cider houses in San Sebastian is one of the best ways to witness Basque food and culture first hand. What is a Basque Cider House? A traditional Basque cider house is not to be confused with a restaurant, according to most cider house owners. Think of it more as a workshop– a brewery of sorts, where the year’s cider is just about finished fermenting. In order to have people taste their cider (which should be sold quickly, as cider is meant to be consumed within a year of bottling), cider house owners began inviting people to come taste the year’s results alongside some delicious home cooked food. At the Basque cider house, there is no menu– you usually pay per person and then the food starts coming! Some places add even more dishes, but these four courses are the standard. 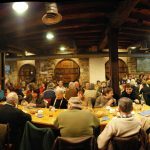 And throughout the meal (which in the traditional places is still eaten on foot, at long shared wooden tables), you can visit the cider barrels as many times as you want, and drink to your heart’s content! At only about 6% alcohol, you can think of cider as a very weak wine, or a rather strong beer– as you prefer! The txuletas ready to go! Juicy salt cod with roasted peppers, an “appetizer” at the Basque cider house! Smokey idiazabal cheese with quince jam and walnuts. Remember that the cider we are talking about is totally different than the hard cider found in other countries. We call it “natural” cider, as it’s simply fermented apples– no added ingredients– and no bubbles or sugar! The special pouring technique aerates the cider and gives it a bit of effervescence. At the Basque cider house you’ll have to work for your drink– forget about bottles, and head straight to the large wooden cider barrels with your empty glass. Learn the incredible history of Basque traditions, like the cider house! Approach your barrel of choice (most cider houses have a few different brews to taste) and get in line for a taste. When it’s your turn, start to serve yourself by holding your cider glass as low as possible– almost touching the floor. Let the cider hit the rim of the glass, where it “breaks” and aerates. Slowly raise your glass towards the barrel and when you have about three fingers of cider in your glass step back and let the next person take over the stream. Most importantly– drink your cider fast! The above technique works perfectly if the cider barrel tap is already open! But what if you want cider and no one is there to open it? If you open the tap you have to yell txotx! and invite others to line up behind you. The trick? You have to stick around until the last person finishes and close the tap! Generally txotx! is reserved for the owners when they open a new tap. 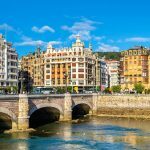 Where Can I Find a Basque Cider House in San Sebastian? 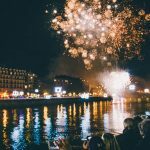 San Sebastian has a variety of nearby cider houses– most are only open in season, though some offer their cider experience all year round. Here are some we’d recommend checking out!